daily horoscopes, biorhythm calculator, Web cams, and weather maps to your desktop. Q: My location is not in the list of available cities. How can I get weather forecasts? A: Some cities and towns may be missing from our list of locations. You can solve this problem in two ways: (a) select a city that is closest to you, or (b) drop us a line at support@weatherscreen.com and we will include a city or town where you reside in the nearest future. If you took the second path, select your country from the drop-down list of available countries and press the Get full list of cities button. Now your location should appear in the list of cities. Q: How can I minimize Weather Screen to the system tray? A: If you take a closer look, there is a button in the right bottom corner of Weather Screens main window. It looks like a light blue triangle. If you press it, Weather Screen will at once minimize to the system tray. Q: How to check biorhythms compatibility with my friend or colleague? A: Go to the Biorhythms window and check Friend's birthday, and then enter his or her birth date. Q: I installed Weather Screen on my computer, but there are no weather forecasts. Why? A: When you launch the program for the very first time, you have to press the Favorite Cities button and select a city where you reside (you can select multiple locations). Once you are done, press either Today or Forecast to see a weather prediction for an active location. If the weather forecast doesn't care to appear, check if you are connected to the Internet and press the Refresh button. In a moment Weather Screen will fetch your weather forecast. 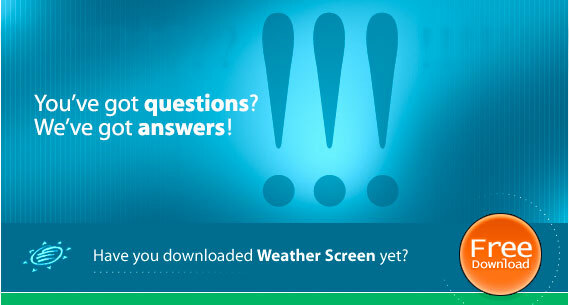 Q: I can't get my weather forecast, what is the problem? (1) You get Data retrieval error caused by low-bandwidth connection to the Internet. Please retry getting your forecast, this problem rarely persists. (2) Our server was overloaded (we've got over 100,000 users who love to see weather forecasts, horoscopes, etc.) and data transfer failed. Again, this is a temporary problem that happens to some users, keep patience and retry later. Press the "Settings" button in the main window of Weather Screen to open the Proxy Configuration dialogue. Then go the Connection tab and press "IE Settings". The program will automatically configure itself with your Internet Explorer settings. Now you should start getting your weather forecast without a hitch. If, by some chance, you happen to use a browser other than Internet Explorer, you may want to contact your Internet Service Provider to ask them the address and port of the proxy server, and then enter this information manually.